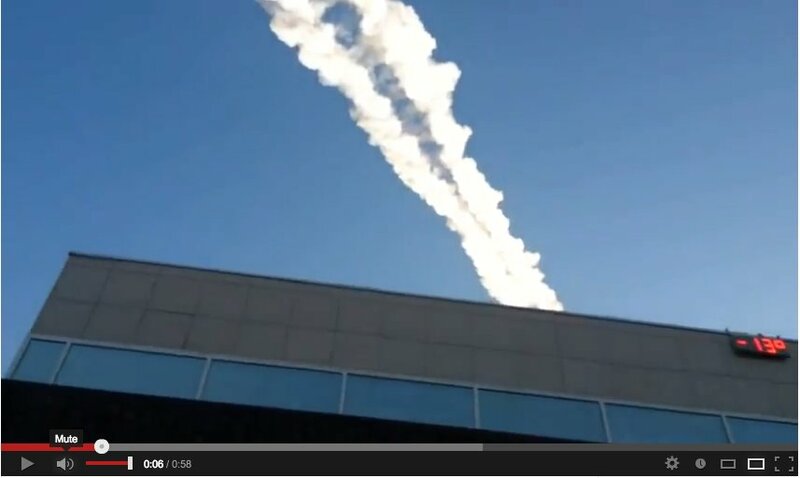 Help scientists to more accurately calculate the trajectory. 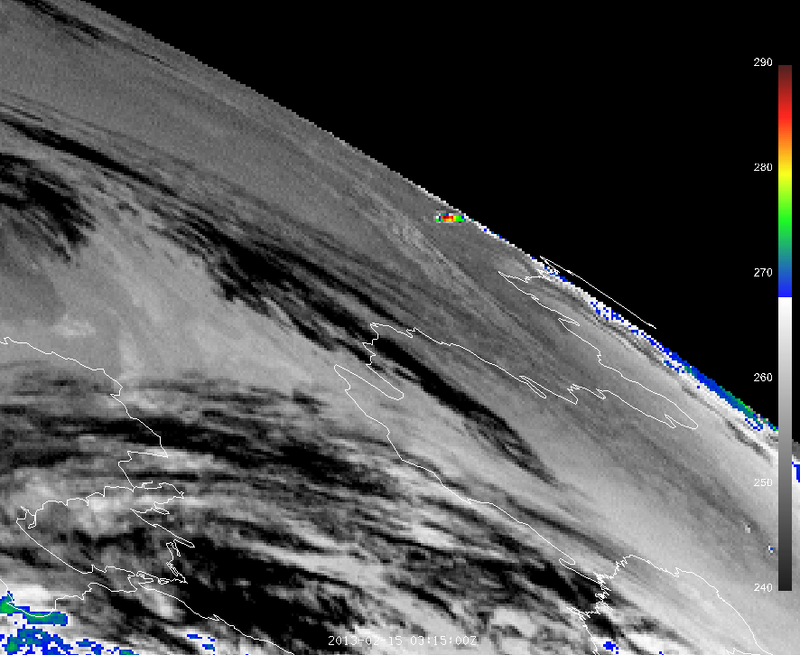 Visit http://www.russianmeteor2013.org/ to contribute videos or help with the analysis. Great stuff Stefan! How about finding the exact points on the ground where the CCTV showed shadows of Lenin’s head and other objects? Then you could go to the spots and place a mirror lying on the ground horizontally and a sextant to measure the az/el of the CCTV camera. 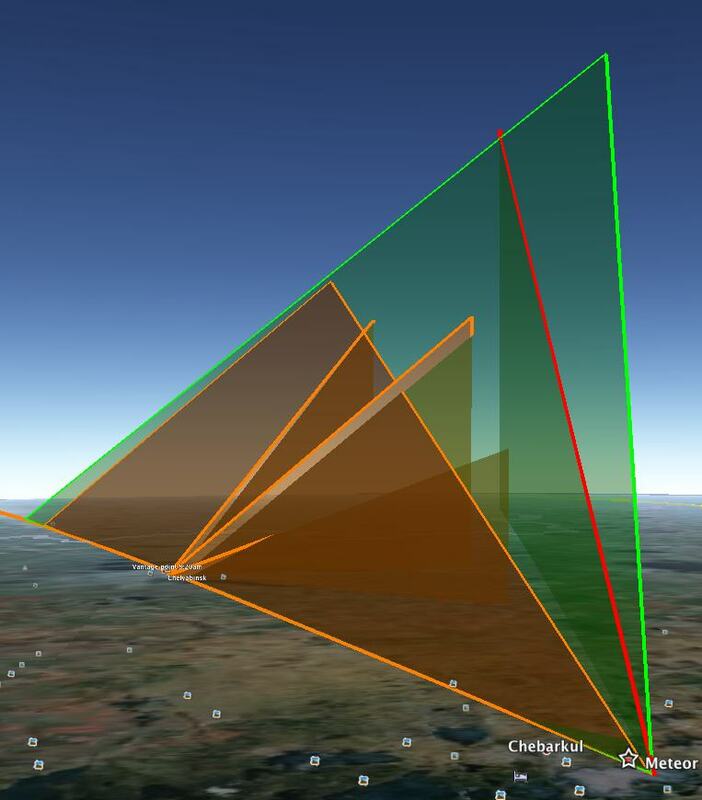 Repeating this for all shadow objects would get a very accurate Az/el for the meteorite, and repeating it from other CCTV sites (especially ones in other towns) enable 3D triangulation of the trajectory. That’s a good idea. Regarding the shadows at Revolution Square, I did some calculations to try and ascertain the camera distortion. I did this by comparing the proportions of distances between the lamp posts in google maps and what those proportions should be when allowing for foreshortening off to the left and right of the camera. That is, the foreshortening as you and I would see when viewing from the camera position, not lens distortion. The distance proportion was greater as viewed from the camera compared with the top-down view, due to foreshortening, as expected but it was further skewed by lens distortion. I found that the 100 degree angle (122 to 222 azimuth) was more like 90 degrees, possibly even less. This decreases the fireball travel by more than 10% because it is the start and end azimuths which are in question. 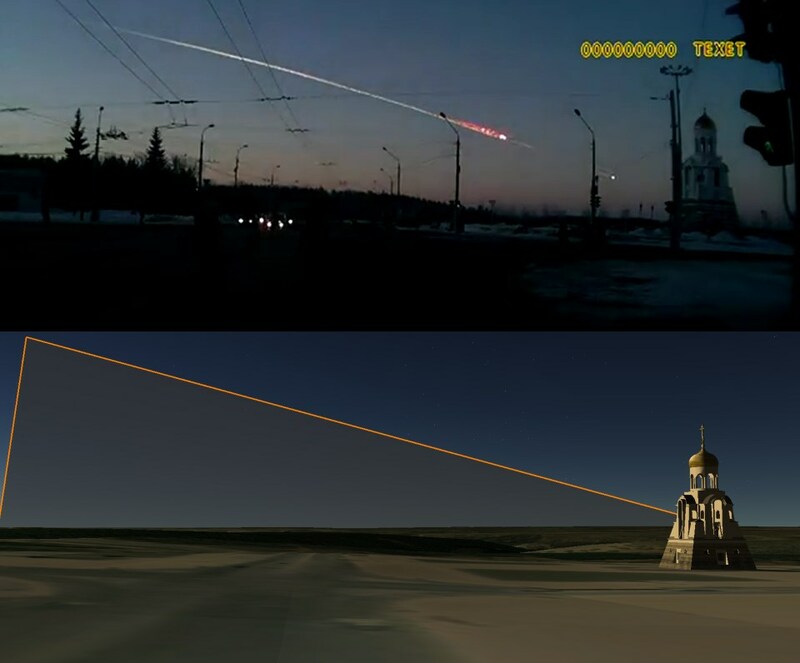 When plotted against the trajectory, this change in azimuth constitutes about a 15 to 20% reduction in bolide travel distance and therefore a commensurate reduction in speed- down to 14 or 15 km per second which is in keeping with what the Russian Academy said. This would completely change the cosmic approach speed and therefore the orbit calculated by Zuluaga and Ferrin. They openly acknowledge that camera distortion has not been accounted for due to a lack of information on the lenses. It appears they used Revolution Square and one other camera for their most accurate azimuth calcs and a dash cam for the speed calc. This dash cam has tram lines ‘hanging’ upwards and measures the bolide from the periphery of the screen. I think Stephan’s work is great and I followed it avidly at the time. I just think that camera distortion does need to be addressed and your method would do that. I’m sure there must be an enthusiastic surveying student who could pop down there on his lunch break and give us the results- if only be could be made aware of our needs! P.S. the Zuluaga and Ferrin paper “additional info” page does show a +\- margin for bolide speed but possibly not based on the camera distortion factor and its only 2 or 3 %. Thanks Stefan.. I miss-stated a bit ! The az/el of the top of the objects needs measuring, not the camera’s position. Also, a plate of water would be better than a mirror, because the water surface (with no wind) would be exactly level. The sextant is used to measure the angle between the reflected image off the water and the real object. One needs to crouch as close as possible to the plate of water placed at each chosen shadow position to minimise parallax. The halve the angle…it.voila ! The direction could be got by the methods you discussed. If the exact position of shadows is a problem, cover the ground with a grid (as archaeologists do) then retrieve the image which the CCTV takes of this, and overlay. 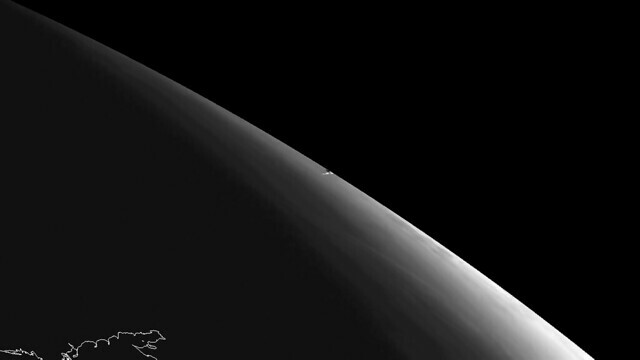 The vapour trail looks double, and I guess it means the meteorite was not a sphere. It might have had lateral g-forces as on an aircraft at an airshow, where the jet plume (even for a single-engined plane)also tends to be in two plumes sometimes. 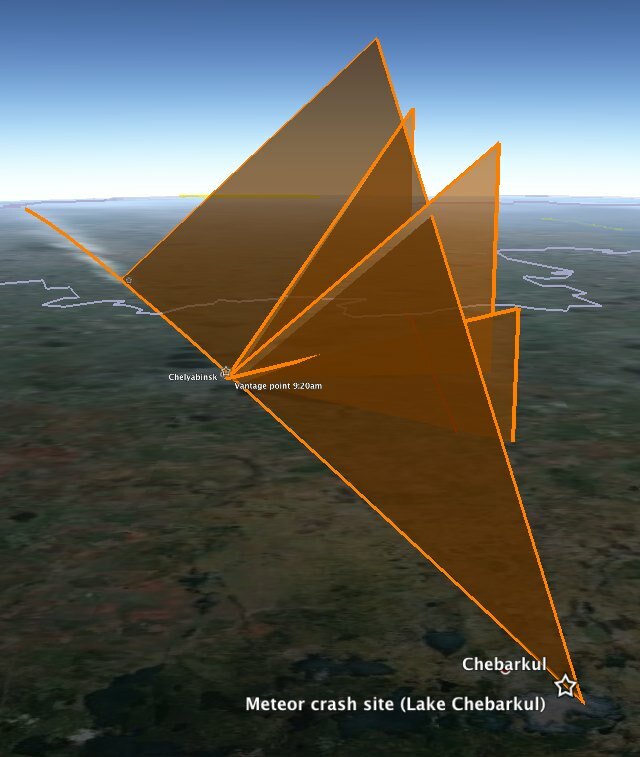 Googling on the re-entry g-forces of Apollo Moon-Earth gives an idea of deliberate deviations occuring on reentry. Scaking-up to the meteroite’s speed might help the maths.